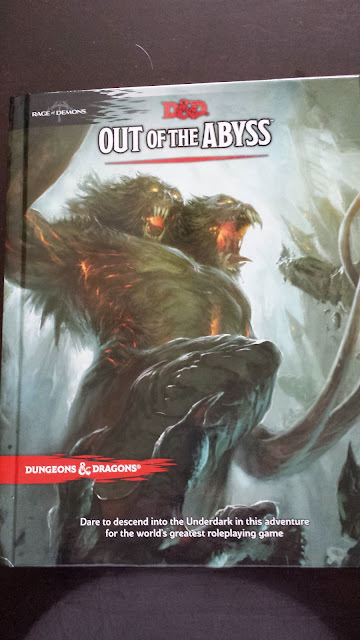 Picked up the latest D&D5 adventure Out of the Abyss this weekend. Part of their whole Rage of the Demons. I am not planning on running this but there are a lot of cool ideas in it. Heck it was worth it for me just for the D&D5 stats of the various demon lords. There is a lot of similarities between this and the GDQ series, which is good for me. Since I am still planning on running GDQ with my kids this all fits nicely. The events of this module are what is going on in the Forgotten Realms while over in my little corner of the multiverse Lolth, Camatoz and *maybe* Orcus are doing their thing. Time for good men and good women to go to war.